I had an epiphany while in Trucchi’s market yesterday: why not surprise Ed with some sweet steamers for supper! How hard could it be, why did we always have to run over to Blue Point for a clam boil to get our fix for a bowl of steamers? (For their clam chowder, of course!!) I purchased about 2.5 lbs of wild caught (it’s not like they have little legs and are elusive in their Maine clambeds!) steamer clams at $3.99/lb and 1 lb of large shrimp (all Trucchi’s offered were farm raised at $7.99/lb) for a cocktail. I topped off the meal prep with a well-chosen chilled Coconut Custard pie and fresh strawberries. I was smiling from ear-to-ear when I got home so Ed knew I was up to something: I confessed to a great mini-feed for supper, dropped the clam bag on to his lap and asked Ed to clean the clams. He was delighted! “Do we have any cornmeal and enough pepper?” Ed asked. Ed hardly remembers what he’s got in his pantry. I can hide stuff in plain sight! 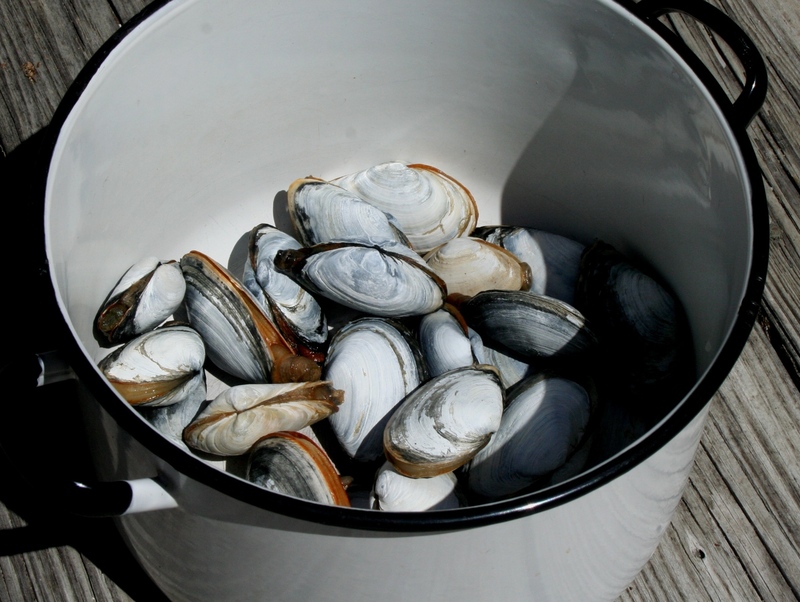 After the clams were cleaned and chilling in the fridge it was up to me to discover how to steam the steamers – I looked through my cookbook collection and grabbed How To Cook Everything and found the super easy recipe that took approximately 5 mins to whip up (what was I thinking???). Of course being me I modified (kudos to Nana B) because the recipe called for dry white wine but I had a bottle of Casal Garcia vinho verde rose open which I substituted mixed with 1/2 cup of water, fresh cracked pepper and sea salt, and poured over the clams in a large pot set to medium high heat. I set the timer for 5 mins (I wasn’t wearing a watch) and began preparing the shrimp cocktail and melting the unsalted butter. Ed prefers large clams while I favor small ones – our feast supplied both – which I scooped into suitable-sized bowls, poured out the clam liqueur and melted butter into teacups, situated the shrimp cocktail just-so on the tray and sashayed the feast out to the dining area. Yum-o! The steamers were very clean and sweet, the shrimp were just the right size and the Bookbinders tart & spicy cocktail sauce was perfect! Dessert followed (pie & berries, from above) which we polished off lickety-split!! Oh, to top everything off we drank sweet green tea (honeyed & minted) throughout the meal – we could have chosen beer but didn’t think of it at the time, haha! Bravo to our Memorial Weekend feast!! !